I tell Minnie about camp life and that I expect to be assigned to the 10th Infantry Division being assembled and trained at Camp Funston. 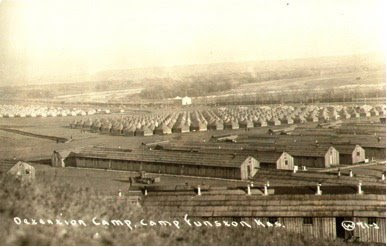 The Conrow family from Manhattan delivers watermelons to Camp Funston recruits. Maybe someday I will get next to some ink & a pen but I guess you can read my scroll by this time. It is raining this evening and seven of us are in the tent. Three of us are writing letters & the others making as much racket as they can. I got two letters from you this noon and got them out to answer them when Ralph Currie brought me in the one you wrote Sunday evening. He heard my name called & brought it up to me when he went to his tent. That shure was a sweet letter and don’t feel bad for a minute about what you said in those other letters about my not writing because I felt very guilty about it at the time, but it seemed as tho I just couldn’t [write] for one reason or another but we are not so rushed in the evening now that we are settled down. I got a big tick full of straw just before dark tonight and with the extra bedding I now have, it can get pretty cold and I will not feel it. Don’t you worry about my not looking natural because I am feeling fine now & in a little while I can sleep in a puddle of water, get up & shake myself, & call it a good night’s sleep. I suppose a person might change some when he begins to learn to kill people instead of how to feed them. My reference to Sherman was to his saying that, “War is hell.” I supposed you would know what I meant. Our sergeant said today that the 10th Division had been moving for the last three days & that he felt shure we would be assigned to it, but of course even that is not definite. I will always remember you as I saw you Sunday. You never seemed sweeter to me before than you did then, but that was so short. You can come up early & stay all day you know if you care to next Sunday. Of course we may be working at something but one can usually get off if word can be gotten to him as soon as his folks come. John Conrow’s folks came up this evening and brought up several great big watermelons. Roy Drown & I were crossing the road to fill our ticks & John called us over & gave us two apiece. It shure tasted good. We had chilli beans for supper tonight & they nearly burned my mouth out. They remind me of the time you & I were down with Charlie & Bertha & had some chilli soup. I slept so warm & comfortable for the first time last night that I came almost not getting up this morning. I am getting now so that I can sleep like a rock. Well, write as often as you feel like & don’t be afraid of writing so much that I can’t read it and I will write as often as I can. Ralph A. Currie was a 21 year-old former schoolmate of mine from Manhattan. John Warren Conrow was born 19 March 1897 in Wabaunsee, Kansas. He was the son of W. A. Conrow, a farmer living on Route 1, Manhattan, Kansas in 1918. He had brown eyes and dark hair according to his military draft registration papers. Roy Elmer Drown was born 9 November 1896 in Manhattan, Kansas. He was the son of bricklayer Joseph M. Drown and Margaret Carolyn Knight (called “Carrie”) who lived at 930 Humboldt in Manhattan. Prior to being drafted into the service, he worked for J. C. Dandore’s Bakery which was located at 1216 Moro in Manhattan. Roy had blue eyes and brown hair according to his draft registration papers. The following day, I write my mother Hattie and tell Willis I'm not having much fun in the army. I got the towel yesterday & your letter today. You don't need to worry about my keeping well. I feel lots better than I did when I left home. The reason I felt so bad Sunday was because I had to take a dose of salts & it cramped me up. Neither of my arms feel a bit sore. I told you Sunday that we had lots to eat. We had had till then but I have been hungry after nearly every meal since. Maybe it is the cold weather but I sure could eat one of your Sunday dinners now. I filled my tick last night and we were issued a good comfort apiece Monday night so it can get pretty cold now & I can keep warm. If you folks haven't anything else to do Sunday, you might come up again, a little earlier & then I will not have eaten dinner. Bring Minnie if you can. It is awful windy tonight. I hope our tents don't blow over. The tents are old & the ropes are rotten so it wouldn't take much to blow it down. We are getting sort of used to the life up here & can stand a balling out without batting an eye. I have never been unlucky enough to get one yet but I will soon enough. Everyone does. We signed the payroll today & will get our pay between the first and the fifth if nothing happens. A person doesn't need much money up here so long as he gets enough chow but when he doesn't, he feels like buying something to finish off on. If I was where I could, I would spend some on haircuts, etc. but they are almost impossible to get here. Tell Willis not to get anxious to get in the army because I haven't found it much fun yet & probably never will. They only gave out one sheet of paper tonight, so goodbye. Minnie tells me about her mother (Eliza Brewer Frey) driving her to Sherman early in the morning with a team of horses. Eliza visits with Mrs. Parkerson and then observes Minnie in her school before returning to Manhattan. Why Ward, I must have sent you regular volumes. I just now noticed my paper pile looked low and when I counted, I found that I have only five sheets left. I bought this box of stationary just before I came up here and you are the only one I have written to with the exception of a couple of letters I sent home. School just went fine today. It’s getting better all the time. Mama visited my school awhile this afternoon and I know she was awful well pleased. I’m anxious to hear what she has to say. I have the dearest little primary students. Mama and I started up here early this morning way before daylight. Papa put the tung in the buggy so we drove a team. I could hardly see to drive for the first five miles, it was so dark. I got here in time to ring half past eight bell. I was sure glad. Mama spent the morning and took dinner at Parkerson’s. It was all just lots of fun and I didn’t mind it a bit excepting Papa’s tire was absolutely ruined last evening. The chains chewed it so. It will cost Papa at least sixty dollars. But I would go three hundred such trips to get to see you. I didn’t get to talk to you much yesterday. I don’t know, I have been wanting to see you so much that I was just kind of overcome with being with you. I didn’t want to talk anyway. I wanted you to do all that. I wanted to hear what you had to say and then I can write you about all I know. I just love to hear you talk. Do you remember what I said one time about your voice? Maybe you don’t – it was a long time ago. But I haven’t changed my mind yet. Ward, one of those letters you got last night or today, you had to pay extra postage for, didn’t you? I hope to goodness you never get it. I didn’t know at the time or rather didn’t think but I sent a letter to France Saturday for Mama and he told me it weighed just an ounce. That’s the limit and I know that letter weighed lots more. I wanted to say something about it yesterday but didn’t get a chance. I wanted to tell you, “For Goodness sake, don’t read part of it.” But you’ll understand the mood I was in and excuse me this time if I promise never to say anything like it again, won’t you? I know I never will because I know now the circumstances. I got a letter today from you and Stella [Munger]. I wasn’t expecting them at all and was sure pleased to get them. I just read your letters over and over. I wish you could get off next Sunday. But I expect it will be at least another week from what you said yesterday. Come home as soon as you possibly can. I thought the folks would probably leave me up here for the next six months before they would come for me again, but Mama said before she left that if it was very pretty weather, they may come after me. I’m going to find out and if our folks go up [to Camp Funston again], I’m sure going to try to get home. I showed your picture to Mrs. Parkerson tonight and she certainly made a fuss over it. “Oh, such a fine manly boy as this is too fine to be used for a target” she said. And, “Well now Minnie, you can be glad you have this with you.” And it certainly didn’t take me long to tell her I was mighty glad. But Mrs. Parkerson is such a good woman. You were certainly right when you said she looked like a good old soul, for she certainly is. And always tries to make me look on the bright side. She is the only one I can talk to about you too, and I get so brimmed full I have to say something to somebody once in awhile. I’m so proud of you, and I’m so glad she is like she is. I certainly hope and pray that you get in over at the College yet. I want you to, just so much. A fellow that’s along in College like you, that’s where they ought to be. I’ve been thinking about you all day. I’m afraid you about drowned in that leaky tent last night. I hope you wrapped up in a half a dozen blankets and was alrght. Are you still feeling badly or is the worst yet to come? I’ll be mighty glad when you get out of that D. Camp. Please don’t misinterpret what I meant by that “D.” After I wrote it, it made me laugh but I didn’t mean a “worse word” even if it does look that way. Say, in your next letter, tell me how long it takes my letters to get to you. It takes four or five days for your letters to get to me. The connections up this way are certainly bad. I had your picture on my dresser but when I sat down here at the table to write, I moved it over here so I could have it right before me. I’ve been writing a few lines, then looking at you for a long time, until it is getting pretty late. And I never keep late hours anymore. P.S. Boy, I’m so glad you don’t smoke. It certainly does please me. Please make great effort to get in college. I tell Minnie how good it was to see her Sunday and confide my fear of becoming homesick. I describe receiving vaccinations and my expectations for going to the target range Friday and Saturday. Well that shure was a measly old rain. We could have been together 2 more whole hours and believe me, hours & minutes count with me when I am with you. It must have gotten rather slippery before you got home but I suppose you got there alright. It shure was cold this morning and I was glad I took that blanket. We were issued a comforter tonight and maybe we can get some straw for our ticks tomorrow. Lots of the boys from other companies are getting it now. Gee! But you were a good sight to see yesterday and Oh! how I long to be with you again as I used to be. It seems so long ago to me. I don’t know how it seems to you. We didn’t have to work very hard today. This afternoon I didn’t do enough to earn my supper but we will make up for it alright sooner or later. I used that comfort kit tonight when I cleaned up for retreat. It shure is a dandy but it will make me think of you so much I am afraid I will get homesick. Not being worked very hard today & just after seeing you, I feel a little blue tonight. You must write everyday a nice big long letter & send it everyday too so I can have something new to think of you instead of just memories, not that they are not pleasant – far from it – but because it reminds me of a time I may never see again. You don’t know how it is to stand in line & see other boys get letters & packages & not get one yourself. But I ought not to complain because you have written oftener than I have anyway. I don’t know whether you liked it or not to be kissed in public by a soldier boy, after having heard certain things you have said, but if you don’t like it, just write me not to do it again the next time I see you and I will do the best I can not to. I won’t say I won’t. One of the boys who lived in Manhattan [had his] wife come up yesterday & brought a doctor’s certificate showing that he had his 3 inoculations, so he got off on a 24-hour pass. I sure wish I could. How would you like to see me drive up there some fine evening on Saturday or Sunday? Our sergeant said today that we would go on the range Friday & Saturday, get our last “shot” Saturday afternoon & I have hopes that we will be jerked out of this hole in 7 or 8 days. I went back to the kitchen last night after you folks left and I sure filled up. The cooks had held back a whole five gallon freezer of cream. We had just all we could [eat] – peaches, grapes, etc. – all we wanted but to pay for that we had to peel potatoes & scrub until about 9:30 o’clock. But I didn’t mind that in the least because I was thinking about you. My, but you did look sweet and I was in those old slouchy “rookie” clothes. 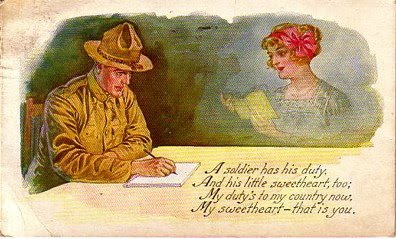 Minnie writes to me from her father's home in Manhattan after visiting me for the first time at Camp Funston. She apologizes to me for complaining that I hadn’t written her and confesses her love for me. Well I am home [in Manhattan] but not up at Sherman. [Your bother] Willis got along fine [on the return trip from Camp Funston]. He put chains on at Army City. Papa had a [tire] blow out [on his car] at Wild Cat [Creek]. We didn’t know it tho and so we waited – [my brother] John and I – at the oil station at end of Colorado Street [in Manhattan]. When the folks didn’t come, we couldn’t imagine what was the matter so I walked down to Carey’s and John walked on out home. Folks were here when he got here and so they did the milking before coming for me. We are going up [to Sherman] in the morning. Mama is going to leave about four o’clock in the morning. Some drive. But Ward, I would not have missed seeing you for anything. But the time flew by far too quickly. Boy you looked nice today, but not well and there’s something about your look that wasn’t natural. It just wanted to make me cry all the time. I believe you are melancholy. You seemed to talk about the terrible things and nothing of funny things in camp life. Don’t think that way, boy. Everything is going to be alright. But Oh, it is so hard for you I know. You read and study your spare time, what little you have. Don’t write to me only when it is most convenient and don’t worry about it because I certainly won’t. I know now how awful busy you are. I’m so ashamed of some of the things I said in those letters you will get tomorrow, but I was so lonesome and didn’t know what I do now. Just look over those words. Don’t read them. I sure appreciate every line I get from you, but you have too many things to think about and so very busy. Don’t worry about writing me regularly. Your mother and I were so jolted up, we nearly “died a laughing” coming home over the bumps. But [your brother] Willis is sure a good driver. We passed several cars in the ditch. I have never thought so much of anything given to me, Ward, as I do of that picture of you. I’m so proud of it. I just love that expression on your face Ward. And you are just ready to smile. I’m just crazy to go back up to see you next week. I can’t see enough of you boy. Maybe we can stay longer next time. I don’t know what I will do when you can come home again (in a Sunday or two, I hope). I think it will be the best thing for you. Ward, I have told you and told you, and have thought how much I love you, but I know now that I never realized how very, very much I do love you, Darling, until lately. I think of you constantly and my heart just aches when I think of you (I guess it’s my heart, I know it just hurts when I take a breath). And dear, I have such nice things to think about when I think of you. I was so proud of you today. You were given leave because you hadn’t smoked. If you had of, maybe we couldn’t have seen you only a few moments. You are such a good fellow. I’m sure you are going to make mighty good. I hope you get in at the College. You probably think I have a spell, but I was never so in earnest in my life, Ward, about you. How did your pies turn out? I’m so glad your mother took you that blanket. For goodness sake, keep warm and dry and don’t get sick. If you want anything, please don’t hesitate to tell us. We are all anxious to do something for you. If I could only do something that would make you real happy. Keep awful good care of yourself, Ward, so you won’t be sicker than you just have to be with that vaccination. P.S. This is terrible writing for a ten year old but I’m sitting in an awful position. My hand is way up where I can’t see my writing. Not very long and we can be together here at home. Won’t that be grand? Four weeks ago tonight, we were. Willis Goodrich Griffing was my twin brother. Now a vacant hayfield, Army City was a World War I commercial complex established to provide entertainment and other services to troops stationed at Camp Funston. It was created in 1917 and abandoned in 1921 after it burned. John Charles Frey was born 17 November 1900 near Ogden, Riley County, Kansas. 45 year-old George S. Carey had a home on west Poyntz Avenue in Manhattan. Minnie chides me for failing to write more often. She describes her school activities, mentions who is going to the State Fair in Topeka, and miscellaneous other news. Says she hopes to come to Camp Funston on Sunday to see me. Here it is Wednesday evening again and not a sign of a letter from you. I suppose you think you are paying me back for not writing sometime when I have been away, but I never went that long. And besides, you were at home, and I am away farther from home than you are. I can’t even talk to home folks and am among absolute strangers. I’ll keep on writing, but you’ll pay for this silence, don’t you forget. I couldn’t hardly stay in the school room this morning when I saw the mail man coming up the road. I just knew he had a letter for me. The folks are attending the Topeka Fair today. They sure have a pretty day for it. I wish I could have gone. Mrs. Parkerson and I are still alone. Mr. Parkerson will come tomorrow evening, I guess. Only two more days, then I get to come home. What if it would rain? It won’t tho – it just can’t. I talked to Stella [Munger] over the phone for a few minutes Sunday. She said she had so much to say when she saw me again. Mr. [Mincher] Condray – Dorothy’s father – stopped in this morning right after I got to school to see how Dorothy was getting along and to tell me she liked school and I don’t know how much more. I don’t like his little personal visits very well. He comes early before any of the children and never wants to leave. He isn’t a very nice man even if he is married. He didn’t find any fault tho. I’m glad of that. Well, how do you like camp life by this time, Ward? I hope you like it as well as I do my school. You’ll be happy most of the time if you do. My, I’m in a hurry for the war to be over. I’ve had enough of it already and you’ve hardly been in it yet. Postman didn’t stop at school house, but I just knew I would get a letter today or never. So I hurried home and here was a note from you. I think they must be giving you intense training. What did you mean when you said, “Sherman said it correctly”? I believe you must be crazy. They must be working you too hard, I guess. I will bring your comfort kit next Sunday. I bought it in Topeka and thought I would get to give it to you [last] Sunday, but didn’t. Why Ward, next Sunday can’t be the last time I can see you. It just must not be. I shouldn’t think you would mind chewing dust. I saw you rolling mud balls in your mouth not many Sundays ago. Which is worse? I sure hope you will get promoted. That’s my only hope for you now. I hope your Colonel is “Dippy” when he tells you things like that. Mr. Parkerson just came home. I hear him talking downstairs. [Bertha’s husband] Charlie is on his way to Washington [D.C.] today. Mama didn’t send me your address. I don’t know why. You said you were hard up for paper. Well, what did you send one sheet with just a little written on it for? You might as well have written all over it on both sides. And then you want me to write and I know if you read all I write in my long letters (it would certainly make me feel fine if I thought you didn’t, even if I did say it would be alright) you would have time to write to me. Next time you get a long letter from me, lay it aside and write to me instead of reading it. It would make me lots happier if you would. And I would know you were sacrificing some of your leisure (if that’s what it is) for me. I know, darling boy that you are awful busy and I believe every word you say. I will try to write big letters often and not say ugly things about your not writing. But it is awful hard sometimes and a big disappointment because I thought you would get to. But I better get use to be disappointed – that seems to be what most of my life is going to be made up of anyway. Well that’s enough of that kind of talk. I had better put down my pen when I get to thinking on that line. School [is] going fine. One of the [Krause] twins ran into a boy today at school and hurt his arm very much. He staid till school was out but I sure felt sorry for him. He was just white, it made him so sick. And I can’t stand to see a big boy cry. I know they are hurt pretty bad or they wouldn’t. It was swollen quite badly. It may have been broken. I wouldn’t know. After supper this evening, we went over to Art Chalmer’s [who married] Mrs. Parkerson’s daughter [Lena]. They are going to the Fair tomorrow. We persuaded Mrs. Parkerson to go along. I told her she wouldn’t need to stay on my account because the folks were coming for me tomorrow evening. You hadn’t better forget you are Ward Griffing. What would I do for a Ward if you did that? And don’t forget that you are to be the same Ward that you have been even if you do have to wear the uniform. If you come back home alright – of course you will – won’t we be proud some day that you wore that uniform? I know I will be. Every morning when we give the flag salute up at the school, I always think of you, what that flag means to you, and what you are willing to sacrifice for it. When I have time, all I think about is my getting a chance to see you next Sunday. But my! I won’t hardly get to see you. Probably get to say, “how do you do” and “good bye.” I wish we could be together all Saturday afternoon and evening, then all day Sunday until I have to come to my school in the evening. Maybe we can when you can leave camp. Don’t you forget anything. I want you to tell me everything when I see you. We have a slow mail carrier on the route now while the other one is taking his vacation. He doesn’t wait for the freight and so the news is three days old before I get it. I don’t like it very well. I hear the coyotes yelling tonight. I heard them the other night in the night and they sure were close. They sounded louder than I’ve ever heard them before. Eben and Lucretia are both in College this fall. They were at home Sunday. I hope you and I will be in College next fall, or what would be almost as good would be for me to be in college and the war over and I looking for you home just anytime. Oh, Ward, I wish that time would hurry and come. Don’t you, boy? You will finish college when the war is over, won’t you Ward? I have my papers graded and my work gone over so I can go to bed early tonight. I never go very late – between nine thirty and ten. I wonder what you are doing now? Write! Write! A long letter, just half as long as mine and they will be big ones. Eben Ellsworth Scholer was the 18 year-old son of Fred and Henrietta Scholer of Milo, Salt Creek Township, Lincoln County, Kansas. Eben’s older brother Charles married Bertha Frey, Minnie’s older sister in 1916. According to his draft registration card, Eben was tall and of medium build, with brown eyes and dark hair. At the time of his registration in September 1918, Eben was a student at KSAC. In the 1930 Census, Eben and Forence Thomas – his wife of four years and a native of Missouri – were living at 105 East 41st Street, in Kansas City, MO. Eben was employed as a civil engineer for an oil company. Lucretia Scholer was the 22 year-old sister of Eben. In the 1930 Census, Lucretia Scholer was single and working as a “Home Bureau Agent” at Bethel College in Newton, Harvey County, Kansas. Mr. Mincher Condray was a 36 year-old farmer whose parents came to Kansas from Indiana. He was born November 1, 1883 in Stockdale, Kansas. His wife was 28 year-old Tilley Hohman. They were married on June 3, 1911, and by 1918 they had three children. These were 6 year-old Dorothy R., 3 year-old Arthur B., and an infant named John. 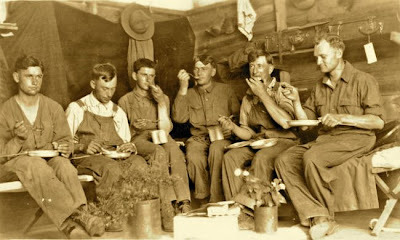 Young recruits taking a lunch break at Camp Funston. Note the variety of uniforms, including overalls! I tell Minnie about my mother’s visit to see me at Camp Funston the previous Sunday. I also describe our duties as new recruits in the Detention Camp. We're given denim overalls to wear instead of uniforms! Please excuse the pencil again as there is no pen & ink on this table. I received another letter from you today & was sure pleased. My, but I wish I could see you. The folks came up last Sunday & said that you went down to Topeka. Maybe you can come up next Sunday. It would be just my luck to be on K.P. or guard that afternoon because they are taking the squads in order & they will be down to mine about that time. I do wish I could get a pass a week from next Sunday but I’m afraid I can’t so you must try & come. If I am off duty, I will be hanging around the hostess house up here. It is a rustic building they are just putting up right in front of headquarters. If I am on K.P., perhaps I might be excused if it were known that I had visitors. I’m sure glad you are making such a success of your school. I knew you would. We recruits sure get the worst of things. In the first place, every once in awhile we have to climb up those hills just back of the camp & carry down rocks for the roads. It is hard work, but we must have hard work in order to match old Fritz. In the next place, we are in tents with only two blankets & no straw for our ticks. The shoes issued now are altogether different from the soft leather shoes they formerly issued. It is very heavy & stiff, and many of them are hobnailed. These are awfully heavy. I suppose you will be glad to hear that I haven’t smoked since I came up here. You said in your last letter you just loved to write to me, so write whenever you get a chance & I will do the best I can. I am sure tired tonight. My feet haven’t filled my heavy, big shoes yet & so they hurt me yet. I wear three socks in my left boot to help out. We have to keep all our belongings in a big bag that would hold about 2 or 3 tons of grain. They gave us overalls to work in & mine are big enough for the biggest man in camp. Even my uniform is not fit to be seen. If I ever get to town, I will sure buy me a few things but we have to be careful what we wear around. 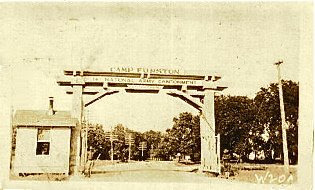 The next day, September 12, 1918, I tell my mother and brother Willis about camp life. September 12 , Army "Y[MCA]"
Well we sure got worked today and will be from now on probably. Some of the men couldn't stand it. The first platoon of our company had to march at Guard Mount this evening. They had to stand at attention for some time & two of the men fell out into the street. The plucky fellows wouldn't give up until they had to. The vaccination is beginning to take & of course it makes some of them sick. I don't believe mine will take this time. We haven't gotten any straw for out ticks yet & this morning we were all stiff with the cold. Some of the boys bought blankets and others brought some with them but we were only issued two. The other day I sent to town by the supply sergeant to get me a wrist watch. The other is so unhandy in a place of this kind. I gave him a ten dollar bill and told him to get the best he could for that. He brought me back a dandy little radio-lite but he paid $12.50. He said he wouldn't advise anyone to get a cheaper one. It has a good Swiss movement & a case like my Ingersoll. We get up before daylight & have some setting up exercises, then mess, & then we have to police up (clean up the camp). We then drill until 12:30 when we again have mess. We have to bolt our dinners & fall in again at 1:30. If you are unlucky to be at the far end of the street, yo shure have to "shake it up" in order to get anything to eat. Yesterday our company commander was promoted & he dug down in his own pocket & gave us an extra good feed -- ice cream and lemonade, etc. I received those books all O.K. Well I wonder what you are doing at home. I suppose Willis must have the wheat ground nearly ready [for planting] by now. I expect a rain wouldn't hurt things any, would it? I sure hope you folks can come up Sunday, but I am afraid that it will be just my luck to be on K.P. or guard about that time. Each day 2 squads are chosen for fatigue duty, 1 for K.P. & one for guard. We get out next shot Saturday. These "Y's" shure are crowded. Men standing around waiting to grab an extra chair. When we get down to Funston, it will not be quite so bad. I have been wearing three socks on my left foot because it was getting sore across the heel. Saturday night they had a free for all boxing match out in front. Any one who wanted to could put on the gloves & of course no one knew what he was getting up against. One little red-haired fellow said he would put 'em on. Another fellow a little bit taller took him on and he sure knocked him all around before they called time on him. A man wants to know something about boxing before he puts on the gloves at an army camp or he is liable to be pounded pretty badly. It was awful hot today & they take us way out toward Junction City where the bluestem grows waist high. Here we had to drill. After drilling quite awhile, we would have a "rest" period & they made us play a game that nearly tore the lungs out of some of us. We had to get in a circle and stoop over and shut our eyes and hold our hands behind us. They gave a belt to one of the men and he [would] turn & hit the man on his right & hit the man on his right, & hit him as hard as he could all the way around. With our heavy shoes & the thick grass, some would slip down but the non-coms made the other other hit them anyway. If a fresh man got behind, a man who had run around there two or three times, the poor fellow shure got his. From the time we go out early in the morning until 12:30, we can't get drinks. In July they had to haul the water & the men got only two drinks a day & had to drill hard too. 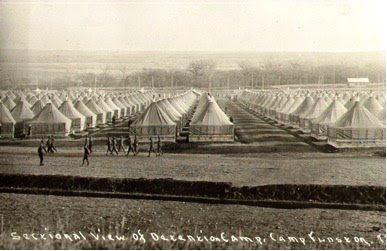 Two views of the Detention Camps at Camp Funston in 1918. I tell Minnie about my expectations that we will be trained quickly and sent to Europe. I also mention my disappointment at not being selected as a squad leader. Had to fall out & were marched about 5 miles to listen to a talk by the Colonel. One thing he said was that the Prime Minister of England [David Lloyd George] said, “For God’s Sake Hurry!” So in all probability we will be sent over [to Europe] very shortly. If you do not hear from me regularly, please don’t blame me for we are being given very intensive training now. Also, I am studying extra for I will be given a shot at corporal. If I make good, I will be promoted. Regulations have been changed somewhat & I must do the very best I can at learning the details. I must make good. For goodness sake, write as often as you can, even if I cannot. I’m sure you understand my case. I’ve nearly lost track of time & hardly know that I used to be Ward Griffing. Sherman said it correctly. Come & see me as soon as possible. It may be the last. I have so very much to tell you that it is hard to start in. In the first place, that comfort kit will be very acceptable immediately. I didn’t want to get one if you were going to send yours. Get my picture of you from the folks & put it in too please. The “Y” is so crowded here & I’m so busy. I’m short on paper so please excuse this poor attempt. The wind is blowing today & everyone is simply nothing but dirt. The dirt got so thick we had to chew it. The squad leaders were just now appointed and I was left out, so maybe I have missed my chance [for a promotion] after all. I may get a chance [again] or maybe I won’t. Sure hope so.